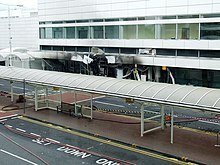 The 2007 Glasgow Airport attack was a terrorist ramming attack which occurred on 30 June 2007, at 15:11 BST, when a dark green Jeep Cherokee loaded with propane canisters was driven at the glass doors of the Glasgow Airport terminal and set ablaze. It was the first terrorist attack to take place in Scotland since the Lockerbie bombing in 1988. The attack took place three days after the appointment of Scottish MP Gordon Brown as Prime Minister of the United Kingdom, but Downing Street dismissed suggestions of a connection. A close link was quickly established to the 2007 London car bombs the previous day. Although the doors were damaged, security bollards outside the entrance stopped the car from entering the terminal, where there were 4,000 people, with the potential for many fatalities. The scene 40 hours after the failed terrorist attack on the main terminal at Glasgow Airport. The airport was back to business as usual by this time. The car's driver was severely burnt in the ensuing fire, and five members of the public were injured, none seriously. Some injuries were sustained by those assisting the police in detaining the occupants. Both of the car's occupants were apprehended at the scene, and all those injured were taken to the Royal Alexandra Hospital in nearby Paisley. Within three days, Scotland Yard had confirmed that eight people had been taken into custody in connection with this incident and that in London. Police identified the two men as Bilal Abdullah, a British-born, Muslim doctor of Iraqi descent working at the Royal Alexandra Hospital, and Kafeel Ahmed, also known as Khalid Ahmed, an engineer and the driver, who was treated for fatal burns at the same hospital. The newspaper The Australian alleged that a suicide note indicated that the two had intended to die in the attack. Kafeel Ahmed died from his injuries on 2 August. Bilal Abdullah was later found guilty of conspiracy to commit murder and was sentenced to life imprisonment with a minimum of 32 years. A dark green Jeep Cherokee, registration number L808 RDT, travelling at a speed estimated by a witness as about 30 mph (48 km/h), struck security bollards in a terror ramming attack at the main entrance to Glasgow Airport. The vehicle was reported to have several petrol containers and propane gas canisters on board. One eyewitness said flames issued from beneath the car when it hit the building, while another eyewitness said it appeared the driver was trying to drive through the terminal doors. According to reports, the car was occupied by two "Asian-looking" men. When the Jeep failed to explode, one man (later identified as Abdulla) threw petrol bombs from the passenger seat and the other (Ahmed) doused himself in petrol and set it alight. Police indicated the vehicle burst into flames when it was driven at the terminal. An eyewitness noted that a man got out of the car and began to fight with police. Another eyewitness said that the man was throwing punches and repeatedly shouting "Allah". The man was arrested and later identified as Bilal Abdulla, a UK-born doctor of Iraqi descent who was working at the Royal Alexandra Hospital. Another man exited the car and ran into the terminal building while he was on fire and began writhing on the ground, before being kicked in the testicles by an airport employee, John Smeaton, who was awarded the Queen's Gallantry Medal for his heroism. Sky News reported that petrol was spread from containers by the occupants when they got out of the car. During the subsequent investigation propane gas canisters were removed from the car. A Strathclyde Police spokesman confirmed the two men in the car were arrested, one of them badly burned. The man was initially taken to Royal Alexandra Hospital in Paisley before being transferred to the intensive care unit at Glasgow Royal Infirmary due to it having a specialist burns unit, where he died on 2 August. The Jeep was removed early on the morning of Sunday 1 July before flights resumed and the airport was partially reopened. Royal Alexandra Hospital's accident and emergency department was evacuated and then closed when a suspected explosive device on the bomber's body was found. Affected patients were taken to the Southern General Hospital and the Western Infirmary. It later emerged the device was not explosive. The second man, Bilal Abdullah, was initially held at nearby Govan police station, one of the UK's high security police stations with the capability to hold terrorist suspects. He was later transferred to Paddington Green Police Station in London, along with two unnamed suspects, after the Lord Advocate Elish Angiolini gave her consent to a combined prosecution in England under English law. In the aftermath of the attack the airport was evacuated and all flights suspended. Evacuated holiday-goers, including some who were left in aircraft for up to ten hours after the event, were accommodated overnight in the Scottish Exhibition and Conference Centre. BAA indicated the airport main terminal re-opened for an incoming flight from Ibiza on 1 July 2007 at 07:37, and began handling departures from approximately 09:00. Automatic Number Plate Recognition (ANPR) technology identified the vehicle of two suspects connected with the Glasgow Airport attack on the M6 motorway, between junctions 18 and 17, near Holmes Chapel, Cheshire. The police brought the vehicle to a slow halt. The suspects, medical doctor Mohammed Asha and his wife, were arrested. The police said they believed the attack was linked to the 2007 London car bombs 36 hours before. The vehicle was reported to have contained 60 litres of petrol, gas cylinders, and nails. Scotland Yard reported that while the gas contained in the canisters and the quantity of the canisters remains unknown, further details would be given after they were analysed by forensic experts. The head of Scotland Yard's counter-terrorism command said, "It is obvious that if the device had detonated there could have been serious injury or loss of life." The device could not have detonated, because it lacked an oxidiser, according to a columnist for The Register (UK). This information may have originated from an interview of former CIA counter-terrorism officer Larry Johnson, conducted by Keith Olbermann of MSNBC on 29 June. According to Sky News, the gas cylinders contained propane, used for patio heaters. A second bomb was later found in a blue Mercedes-Benz 280E believed to have been left in the same area at around the same time. The illegally parked car received a parking ticket in Cockspur Street at 02:30. At about 03:30 the car was transported to the Park Lane car pound. Staff left the car in a public area after smelling petrol fumes and alerted police on hearing about the first bomb. US officials told NBC News that three men had been identified and were believed to be from Birmingham. The network reported that one of the three men could be an associate of Dhiren Barot, an Indian convert to Islam who was sentenced to life in prison in 2006 for plotting to fill limousines with explosives similar to those found in these incidents and park them in garages beneath hotels and office complexes. Bharot also planned to attack five financial landmarks in the United States: the New York Stock Exchange and the Citigroup Center in New York City; the International Monetary Fund and the World Bank, both in Washington, D.C.; and the Prudential Building in Newark, New Jersey. Scotland Yard denied claims from a report by ABC News that police had a "crystal clear" picture of one suspect from CCTV footage. A 27-year-old doctor from India, Mohammed Haneef was arrested at Brisbane Airport in Australia on 2 July in connection with the bombings in the UK. He was arrested while trying to board a flight with a one-way ticket to Bangalore, India, apparently to visit his newly born daughter. The arrest followed information received from the UK. The case against him collapsed and Haneef was released . On the afternoon of 1 July, police carried out a controlled explosion on a car in the car park of the Royal Alexandra Hospital, where one suspect was being treated. The hospital was cordoned off for a time, and ambulances were redirected to other local hospitals. It is not clear if there was another device attached to the second car. Police made two further arrests in Paisley in the early hours of 2 July in connection with the attack, bringing the total number of arrests to seven. At least two suspects are thought to be locum physicians reportedly working at the Royal Alexandra Hospital and at a Staffordshire hospital. These hospitals were the subject of police searches. On 2 July 2007, an eighth person was detained in Australia in connection with both the Glasgow and London attacks. Australian news reports indicated that two people in Queensland were detained for questioning. Both were doctors; one, Mohammed Asif Ali, was released after questioning with no charges being brought. The other, Mohamed Haneef, 27, graduated from the Rajiv Gandhi University of Health Sciences in India in 2002 and entered Australia due to the shortage of doctors in regional hospitals. He was working as a registrar at a Gold Coast hospital and was detained at Brisbane Airport while trying to board a one-way flight to India via Kuala Lumpur in Malaysia. His family claimed that Haneef's link to the alleged attackers was tenuous, he was not involved in the plot, and that he was returning to India to see his wife and ten-day-old daughter. Kafeel Ahmed, aka Khalid Ahmed, born in India, studying for a PhD in engineering. Taken to hospital after the attack and treated for burns over 90% of his body surface. Died from his injuries, 2 August 2007. Mohammed Asha, 26, from Jordan. Arrested on the M6 motorway. Later found not guilty of conspiracy to murder and conspiracy to cause explosions; he contested deportation and eventually returned to work. Marwah Dana Asha, 27, from Jordan. Wife of Mohammed Asha and arrested with him on the M6 motorway, later released without charge. Sabeel Ahmed, 26, born in India. Arrested in Liverpool. A doctor who works at Halton Hospital in Cheshire. Brother of Kafeel Ahmed. Mohamed Haneef, 27, from India. Detained at Brisbane Airport, Australia and later charged with recklessly supporting a terrorist organisation, charges which have now been dropped. Currently appealing cancellation of his work visa by the Australian government. Second cousin of Kafeel and Sabeel Ahmed. Unnamed 28-year-old Saudi man, arrested in Houston, Renfrewshire. Reported to be a medical student working at Royal Alexandra Hospital. Released without charge. Unnamed 25-year-old Saudi man, arrested in Houston along with unnamed 28-year-old. Also reported to be a medical student at the RAH. Released without charge. The BBC reported that eight people were being questioned, most of whom had worked for the NHS and five of whom were doctors. Abdullah, along with Ahmed, is believed to have been responsible for leaving car bombs in London two days prior to the Glasgow Airport attack. Abdullah was the owner of the Jeep and was charged with conspiracy to cause explosions. He was remanded in custody awaiting trial, and was ultimately given two concurrent life sentences, of which he would be required to serve at least 32 years in prison. While Ahmed was on fire inside the car, Abdullah reportedly attacked Sergeant Torquil Campbell at the scene, in an attempt to prevent him from approaching the burning vehicle, running to the rear of the vehicle to try to open the back hatch. During the scuffle, police officer Stewart Ferguson was spraying the burning man with a fire extinguisher. Popping and banging could be heard coming from the vehicle. A suicide note left behind indicates that the men intended to die in the attack. A resident of Neuk Crescent, Houston, outside Glasgow, Bilal Abdullah was born on 17 September 1980 in Aylesbury, Buckinghamshire, where his father, a medical doctor, was working. He qualified in medicine in Baghdad in 2004, and first registered as a doctor in the UK in 2006. He was given limited registration by the General Medical Council (GMC) from 5 August 2006 to 11 August 2007. He worked at the Royal Alexandra Hospital, Ward 10, in Paisley as a locum house-officer in the diabetes department, dealing with outpatients at a drop-in clinic and obstetric clinics. He had links to the Sunni Wahabist sect of Islam and radical Islamic groups, and had been disciplined for spending too much time on the internet at the Royal Alexandra Hospital. He is also said to have come to the notice of the security service, after visiting Islamist websites. A silver Vauxhall Astra, which was subject to a controlled explosion by police on 3 July 2007, was believed to have been rented by Dr Abdullah. During his testimony at his trial, Bilal said his motivation was retaliation for the destruction of Iraq, first through sanctions that included even medicine, the rise of childhood leukaemia there, which he blamed on depleted uranium armour-piercing shells used in the 1991 Gulf War, and for destruction of infrastructure during the US and British 2003 invasion of Iraq. Kafeel Ahmed and Bilal Abdullah were also behind the 2007 London car bombs plot, and investigations were being carried out to unearth a possible involvement with the deadly 2005 Indian Institute of Science shooting, an attack by unknown suspects still at large. Abdullah had been given limited registration by the General Medical Council (GMC) from 5 August 2006 to 11 August 2007. The GMC's interim orders panel made a determination, subsequent to the Glasgow Airport attacks, that Abdullah's registration should be suspended as an interim measure; it was suspended until its expiry. On 17 December 2009 he was convicted at Woolwich Crown Court of conspiracy to murder for the incidents in both London and Glasgow, and sentenced to life imprisonment with a requirement that he spend at least 32 years in jail. Ahmed was often mistakenly referred to as a medical doctor. He was arrested in Great Britain in the aftermath of the 2007 Glasgow Airport attack. He was held hospitalised at the Glasgow Royal Infirmary in a critical condition, after he suffered severe burns in the attack. He had suffered burns to 90% of his body, and was not expected to survive—he had already been revived twice as of 4 July. A suicide note left behind indicates that the passengers of the vehicle, Ahmed and Bilal Abdullah, intended to die in the attack. Kafeel was the brother of Sabeel Ahmed, also arrested in the aftermath of the attack. Mobile phone records have shown that, during his 2005–2007 stay in India, Ahmed had frequent communications with Malta, the United Kingdom, Finland, Saudi Arabia and Oman. In May 2007, prior to departing to Britain from his native Bangalore, he entrusted to his mother a compact disc that he said contained some important information on his "project". The disk has been handed over to police for analysis. The disk contained speeches by al-Qaeda leader Osama bin Laden, propaganda against the United States and Britain, and some literature on jihad and the plight of Muslims in Iraq, Afghanistan and Chechnya. Ahmed followed campaigns in Iraq, Afghanistan and Palestine, and frequented Islamist chat rooms on the Internet. Digital material found included graphic depictions of real-life occurrences of torture in Chechnya, hundreds of bomb designs from the Internet, and evidence that he used the Bangalore-based political platform Discover Islam for the purposes of recruitment. According to police sources, Ahmed was an engineer pursuing a PhD in computational fluid dynamics at Anglia Ruskin University, Cambridge, in the UK, on the topic of "Computational Approach to Ink-jet Printing of Tactile Maps." He would have earned a bachelor's degree in mechanical engineering from India, and an MPhil degree in aeronautical engineering from Queen's University Belfast. He might have been in the UK as early as September 2003. He is believed to have organised a Chechnya Day Meeting in his native city of Bangalore in February 2006. He was a member of the Tablighi Jamaat missionary sect. As an aeronautics engineer, Ahmed was able to secure employment, from December 2005, to August 2006, with Infotech, an Indian outsourcing company servicing clients such as Airbus and Boeing, before resigning abruptly. He may have had access to sensitive design information about various aviation companies. Kafeel Ahmed and Bilal Abdullah were behind the 2007 London car bombs plot, and investigations are being carried out to unearth a possible involvement with the deadly 2005 Indian Institute of Science shooting, an attack by unknown suspects still at large. Prior to his attacks in London and Glasgow, he had visited numerous Islamist websites, including that of the Jamaat al Dawa, the parent organisation of Islamic terrorist organisation Lashkar-e-Toiba. On 2 August 2007, Strathclyde Police reported that Ahmed had died in the Glasgow Royal Infirmary. His last rituals were held in the UK. Smeaton, a bag handler, was off duty when he saw the incident start to develop. He heard three explosions as he smoked a cigarette during his break. He ran over to help the police. Smeaton aimed a kick at the testes of Kafeel Ahmed, who later died from 90% burns following the attack. During the incident Smeaton also helped drag Michael Kerr to safety after Kerr had been left lying with a broken leg beside the burning jeep after kicking Ahmed. The incident has been described as inspiring others to take personal initiative and act decisively in a crisis. Newsagent and former policeman Mohammed Afzah cited Smeaton as inspiration for his facing down and repelling a would-be armed robber. In late July, Smeaton returned to his old job as a baggage handler at the airport. Later in the year he accepted a job as head of security at a nearby company. Smeaton was awarded the Queen's Gallantry Medal; this was presented by The Queen at a ceremony at Buckingham Palace on 4 March 2008. In July 2010 it was announced that seven others would be awarded the Queen's Commendation for Bravery for their parts in combating the threat. Scottish First Minister, Alex Salmond, along with the Cabinet Secretary for Justice Kenny MacAskill and the Lord Advocate Elish Angiolini participated in the COBRA meeting chaired by Gordon Brown. Salmond stated that "The incident at Glasgow Airport today as well as recent events in London show that we face threats both north and south of the border – and both the Scottish and UK governments are united in our determination to stand up to that threat to protect our communities". Kenny MacAskill, the Cabinet Secretary for Justice, insisted that the recent terrorist attack on Glasgow Airport was not committed by 'home-grown' terrorists. The Prime Minister, Gordon Brown, was kept briefed on developments by officials. He chaired a meeting of COBRA, the government's emergency committee, on the evening of the Glasgow incident to deal with both it and the two London car bombs of the day before. He also spoke to the First Minister of Scotland Alex Salmond regarding the incident. Brown further addressed the issues by telling the media, "I know that the British people will stand together". He thanked emergency services and urged the public to remain vigilant. At 20:15, the Home Secretary, Jacqui Smith, announced that the incident was being treated as a terrorist attack and that the United Kingdom terrorism threat level had been elevated from "Severe" to "Critical", meaning "further attacks are expected imminently". On the night of the attack, Scottish television station STV was meant to broadcast a one-off programme on the soon-to-be-released movie (at the time of the incident), Die Hard 4.0, however due to the nature of the film, the decision was taken to replace the programme. National TV channel ITV changed its schedule on the night of Monday 2 July following the attack: it was to show the film Die Hard 2 (which is about terrorists attacking an airport) as the Monday evening film, but replaced it with Cliffhanger. On 4 July, the national status was lowered from "Critical" back to "Severe". United States Secretary of Homeland Security Michael Chertoff stated that "We have been in close contact with our counterparts in the U.K. regarding today's incident at the Glasgow airport and yesterday's car bomb discoveries in London. Our law enforcement and intelligence officials are closely monitoring the ongoing investigations. The senior leadership of the U.S. government has been meeting on these issues both yesterday and today. DHS and the FBI have provided updates and protective measures guidance to our state and local homeland security and law enforcement partners". Gordon Johndroe, a spokesperson for the United States National Security Council, told reporters that the National Security Council is "in contact with British authorities on the matter." Secretary-General of the United Nations Ban Ki-moon has condemned the attack and vows to fight for an end to global terrorism. According to the Metropolitan Police extra officers were deployed at landmarks, airports, railway stations and bus terminals across the country on Sunday with orders to increase the use of stop and search powers, while armed police were patrolling major rail stations. They also said that there would be at least 450 officers monitoring a Concert for Diana at Wembley Stadium on Sunday, 1 July in memory of Diana, Princess of Wales. In response to both the attack on Glasgow Airport and the attempted attacks on London, security around the ongoing Wimbledon tennis championships in south-west London was increased, with the use of concrete car blockers. Security measures were also increased at the T in the Park music festival in Balado, Kinross, which took place the weekend after the attack on Glasgow Airport. Before the attacks, vehicles were allowed to drive in front of the front terminal; after the attacks the entrance to the airport for any vehicles was blocked off. At approximately 08:00 on 1 July 2007, the police stated that a phased reopening would begin, allowing the airport to return to normal. The first flight after the incident was due to leave at approximately 09:00. Strathclyde Police searched a number of houses in nearby Houston. At 15:10 (23 hours 59 minutes after the attack), the main terminal building (Terminal 1) re-opened. The inner lanes immediately in front of the terminal building remain off limits to all vehicles, and only authorised public transport vehicles are being allowed to use the outer lanes. Police in Liverpool arrested one man in connection with the events in Glasgow and London, and two people were arrested by police on the M6 near Sandbach in Cheshire. Two Liverpool addresses were searched, in the Mossley Hill and Toxteth areas. Mohammad Sarwar, MP for the nearby constituency of Glasgow Central, reported that threats had been made against the Muslim community in Scotland following the incident. Damage caused to the terminal from the inside after the attacks. Edinburgh, Aberdeen, Cardiff, Belfast, Birmingham, Manchester and Newcastle's airports all took measures to prevent similar action by blocking off roads approaching and in front of the terminal buildings, with the terminals and blockades policed by local police forces. London Luton Airport moved the taxi ranks away from the main terminal building. Blackpool International Airport was shut down temporarily. Glasgow Prestwick, the city's second airport, was kept open with armed police on site. London Heathrow Airport advised people not to bring private cars near the passenger terminals for security reasons. 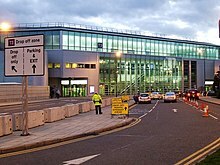 On the evening of 30 June, Liverpool John Lennon Airport was closed for eight hours while a vehicle was removed and taken away for forensic testing, reopening at about 04:40 on Sunday morning. Pearson International Airport, in Toronto, Ontario, Canada increased security measures in response to the attack. White House Press Secretary Tony Snow said that airport security in the United States would be tightened, but that the airport terror alert level would remain at its current status, "Orange" (also called "High"), where it has been since late 2006. An additional issued statement from the Homeland Security Secretary Michael Chertoff stated, "... at this point, I have seen no specific, credible information suggesting that this latest incident is connected to a threat to the [United States]." An article on the website of ABC News alleged that United States law enforcement officials were informed two weeks prior to the Glasgow incident of possible attacks on "airport infrastructure or aircraft" in Scotland and the Czech Republic, leading to the placement of Federal Air Marshals on flights into and out of Glasgow and Prague. On 1 July, the American Airlines terminal at John F. Kennedy International Airport in New York was evacuated due to a suspicious package left on the kerb. On 1 July the police asked to hear from anyone with information about the dark green Jeep Cherokee, registration number L808 RDT, and also asked for any amateur footage or photos taken of the vehicle on fire. This attack, and the earlier attempt in London, were both notable as high-profile, yet substantially unsuccessful. The public reaction – particularly in the blogosphere – was amusement as much as fear. The baggage handler John Smeaton became a minor celebrity following his actions in curbing the attack and the news interviews he gave, and was awarded the Queen's Gallantry Medal. The trial of Bilal Abdullah, arrested at the scene of the attack concluded in December 2008. During the trial more details emerged of the connection between the Glasgow attacks and the attempted car-bombing of London's West End just a few days earlier. Abdullah and Kafeel Ahmed were linked to both attacks. E-mail and mobile phone conversations indicated the men first contacted each other in February 2007. Receipts and CCTV images discovered by police showed Kafeel Ahmed bought components for an improvised bomb, including nails, from hardware store B&Q. The pair were also believed to have carried out reconnaissance in London. On 28 June 2007 Ahmed and Abdullah left Scotland in the two-second-hand Mercedes vehicles and were recorded on CCTV driving to London and parking both vehicles in locations in the West End. After the bombs failed to detonate the men stayed at the Newham Hotel, Romford Road, before leaving London by train via Stansted. They were then captured again on CCTV at Johnstone railway station, near Glasgow. Returning to the "bomb factory" in Glasgow they modified the Jeep into an improvised bomb. In 2012 the Strathclyde Police officer in charge of the initial entry to the house @ Houston, Renfrewshire spoke to the press; their reports refers to: ' The team — which carried out a series of raids following the bombing — managed to enter the house safely and uncovered a staggering cache of bomb-making equipment. mid the debris scattered about the house were cutting equipment, tools and diagrams the bomb-makers used to put their deadly weapons together. After filling the Jeep with explosive material, Abdullah and Ahmed left early the following morning, driving around the Loch Lomond area for several hours before attempting their failed attack on Glasgow Airport. A New York Times report on the trial refers to: 'But evidence at the trial showed that the two vehicles had failed to explode despite repeated signals from the mobile phones because of faulty assembly of the so-called fuel air bombs involved. Prosecutors said that a laptop owned by Dr. Abdulla — found in the Jeep that crashed into the air terminal — showed that the two men had studied blueprints for the bombs that they had found on Islamic extremists' Web sites. In lengthy testimony, Dr. Abdulla said he had intended only to give people in Britain "a taste of fear" and a "scare" with the bombings, not to kill people. But the chief prosecutor, Jonathan Laidlaw, said the timing of the attacks, at the height of Friday night crowds in central London, and on Glasgow airport's busiest day of the year, showed that the attackers had aimed at "committing murder on an indiscriminate and wholesale scale." Following the trial verdict, Abdullah was sentenced to life imprisonment with a minimum of 32 years as a result of his involvement in both incidents. ^ a b c d e f g h "British police arrest 2 more in terror probe". MSNBC. 1 July 2007. Archived from the original on 2 July 2007. Retrieved 1 July 2007. ^ "UN chief Ban deplores terrorism in Glasgow, London". International Herald Tribune. 1 July 2007. Archived from the original on 7 December 2008. Retrieved 1 July 2007. ^ "A time for vigilance". Scotland on Sunday. 1 July 2007. Archived from the original on 4 July 2007. Retrieved 6 July 2007. ^ Kirkup, James; Macdonnell, Hamish (3 July 2007). "Airport attack nothing to do with Brown's Scottish roots, says No 10". The Scotsman. Edinburgh. Retrieved 6 July 2007. ^ a b "The day terror came to Glasgow Airport". BBC News. 30 June 2017. Retrieved 30 June 2017. ^ "Blazing car rammed into Glasgow Airport". CNN. 30 June 2007. Archived from the original on 3 July 2007. Retrieved 30 June 2007. ^ a b Leppard, David (1 July 2007). "Britain under attack as bombers strike at airport". The Times. London. Retrieved 1 July 2007. ^ "More suspects held in UK terror attacks". CNN. 30 June 2007. Archived from the original on 3 July 2007. Retrieved 30 June 2007. ^ "Five Doctors Held Over Attacks". BSkyB. Archived from the original on 14 October 2007. Retrieved 19 November 2010. ^ "Hospital staff stunned as doctors are questioned". The Guardian. London. 3 July 2007. Retrieved 16 July 2008. ^ a b "Glasgow Airport attack man dies". BBC News. 3 August 2007. Retrieved 16 July 2008. ^ a b "Appeal over Jeep used in attack". BBC News. 1 July 2007. Archived from the original on 13 July 2007. Retrieved 1 July 2007. ^ "Eyewitness 'tackled' burning man". BBC News. 30 June 2007. Retrieved 22 April 2010. ^ "Glasgow, London Attacks Believed Tied". Time. 30 June 2007. Archived from the original on 5 July 2007. Retrieved 30 June 2007. ^ a b "Airport alert 'is terror attack'". BBC News. 30 June 2007. Archived from the original on 12 July 2007. Retrieved 30 June 2007. ^ Cowell, Alan; Bonner, Raymond (1 July 2007). "Britain on Edge After Car Slams into Airport". The New York Times. Retrieved 1 July 2007. ^ a b Townsend, Mark (30 June 2007). "Terror threat 'critical' as Glasgow attacked". The Guardian. London. Retrieved 30 June 2007. ^ "Doctors among those detained in UK terror probes". CNN. 2007. Archived from the original on 20 August 2007. Retrieved 3 August 2007. ^ Cowell, Alan; Bonner, Raymond (1 July 2007). "4 Held in Scottish Attack as British See Broader Plot". The New York Times. Retrieved 3 August 2007. ^ "Eyewitness 'tackled' burning man". BBC News. 30 June 2007. Archived from the original on 7 July 2007. Retrieved 30 June 2007. ^ "2 Men in Flaming Car Ram Glasgow Airport". The Guardian. London. 30 June 2007. Archived from the original on 3 July 2007. Retrieved 30 June 2007. ^ "Glasgow Airport attack man dies". BBC News. 3 August 2007. Archived from the original on 16 August 2007. Retrieved 5 August 2007. ^ a b c "Blazing car crashes into airport". BBC News. 30 June 2007. Retrieved 30 June 2007. ^ a b "Burning Car in Airport Terminal". Sky News. 30 June 2007. Archived from the original on 3 July 2007. Retrieved 30 June 2007. ^ "Terror suspects moved to London". BBC News. 3 July 2007. Archived from the original on 17 August 2007. Retrieved 6 July 2007. ^ McKenzie, Steven (1 July 2007). "Sleepless and fed in the SECC". BBC News. Retrieved 1 January 2010. ^ Ken Adams (9 July 2007). "Glasgow victims were stranded for ten hours". Daily Express. Retrieved 16 July 2008. ^ "Airports respond to terror alert". BBC News. 1 July 2007. Retrieved 1 July 2007. ^ "Car Bombings Suspect 'On the Run'". BBC News. 2 July 2007. Archived from the original on 14 August 2007. Retrieved 2 July 2007. ^ "Q&A: UK terror investigation". BBC News. 1 July 2007. Retrieved 9 July 2010. ^ a b "Airport re-opens after car alert". BBC News. 1 July 2007. Archived from the original on 7 July 2007. Retrieved 1 July 2007. ^ "Beavis and Butthead in London jihad". Retrieved 9 December 2015. ^ a b "'al-Qaeda' puts on big shoes, red nose, takes custard pie". Retrieved 9 December 2015. ^ "Two Bombs Were Set To Blow in London". Sky News. 29 June 2007. Archived from the original on 17 May 2008. Retrieved 9 July 2010. ^ "London car bombs timeline". BBC News. 30 June 2007. Retrieved 13 July 2010. ^ Duncan Gardham and Sally Peck (29 June 2007). "Second car bomb found in London's West End". The Daily Telegraph. Retrieved 13 July 2010. ^ "Police hunt for London car bomber". BBC News. 29 June 2007. Retrieved 9 July 2010. ^ Pierce, Andrew (5 July 2007). "Ties that bind terror car bomb suspects". The Daily Telegraph. London. Archived from the original on 5 June 2008. Retrieved 16 July 2008. ^ "Haneef released as charges dropped". The Age. Melbourne. 27 July 2007. Retrieved 9 July 2010. ^ "Police Blow Up Car at Hospital". Sky News. 1 July 2007. Archived from the original on 9 October 2007. Retrieved 16 July 2008. ^ "Two more held over bomb attacks". BBC News. 2 July 2007. Retrieved 1 January 2010. ^ "Car bombing suspects: who are they". Sky News. 2 July 2007. Archived from the original on 9 October 2007. Retrieved 16 July 2008. ^ "Eighth person held overseas". BBC News. 2 July 2007. Retrieved 1 January 2010. ^ a b "Al-Qaeda 'hinted at alleged doctor attacks'". ninemsn. 4 July 2007. Archived from the original on 7 December 2008. ^ "Doctor arrested over UK plot named". ninemsn. 3 July 2007. Archived from the original on 7 December 2008. ^ "Hospital registrar in terror bust". news.com.au. 3 July 2007. Archived from the original on 4 July 2007. Retrieved 16 July 2008. ^ "Australia detains terror suspect". BBC. 3 July 2007. Retrieved 1 January 2010. ^ Dhillon, Amrit (5 July 2007). "Doctor's family explains plane ticket, SIM card". The Age. Melbourne. Retrieved 16 July 2008. ^ a b Herbert, Ian; Cahal Milmo (3 July 2007). "Brilliant student, doctor – and now a terror suspect". The Independent. London. Archived from the original on 5 July 2007. Retrieved 7 July 2007. ^ "An Indian Muslim behind the Glasgow terror plot". TimesNOW.tv. 5 July 2007. Archived from the original on 9 July 2007. Retrieved 5 July 2007. ^ a b c d e f g "Bomb plot: Arrests and releases". BBC News. 5 October 2007. Retrieved 16 July 2008. ^ a b "Doctor guilty of car bomb attacks". BBC News. 16 December 2008. Archived from the original on 18 January 2009. Retrieved 16 January 2009. ^ Cleared car bomb doctor allowed to remain in Britain The Telegraph, 7 August 2009. ^ "Woman released in bomb plots probe". Buckinghamtoday.co.uk. 13 July 2007. Archived from the original on 7 December 2008. Retrieved 13 July 2007. ^ Pierce, Andrew (5 July 2007). "Ties that bind terror car bomb suspects". The Daily Telegraph. London. Retrieved 5 July 2007. ^ a b "Two bomb attack suspects released". BBC News. 15 July 2007. Retrieved 22 April 2010. ^ BBC1 News 8.30 am 3 July 2007. ^ a b Sengupta, Kim; Milmo, Cahal (5 July 2007). "Police link suspects held over failed attacks". The Independent. London. Archived from the original on 1 October 2007. Retrieved 5 July 2007. ^ "British police charge Iraqi doctor over failed car bombings". The Hindu. Chennai, India. 7 July 2007. Archived from the original on 30 September 2007. Retrieved 7 July 2007. ^ "Doctor gets two life sentences in U.K. bomb plot". CTV News. Archived from the original on 18 December 2008. Retrieved 19 November 2010. ^ Fresco, Adam (5 July 2007). "Duo who attacked Glasgow airport 'were resigned to death', say officers". The Times. London. Retrieved 5 July 2007. ^ Butcher, Tim; Alleyne, Richard (4 July 2007). "Our son is not a fanatic. This is a mistake". The Daily Telegraph. London. Archived from the original on 5 July 2007. Retrieved 4 July 2007. ^ a b "Airport terrorist in flaming Jeep was born in UK". Edinburgh Evening News. 4 July 2007. Archived from the original on 2 November 2007. Retrieved 4 July 2007. ^ a b c "Australia drops doctor's terrorism charge as 'embarrassing mistake'". The Scotsman (Online). 28 July 2007. Archived from the original on 2 February 2013. Retrieved 27 September 2007. ^ "Who are the car bomb suspects?". BBC. 4 July 2007. Retrieved 4 July 2007. ^ "The middle-class militants seeking bloody martyrdom". Edinburgh Evening News. 4 July 2007. Archived from the original on 2 November 2007. Retrieved 4 July 2007. ^ "MI5 knew of some doctor suspects". Malaysia Sun. 4 July 2007. Archived from the original on 27 September 2007. Retrieved 4 July 2007. ^ "Terror warning in code". Herald Sun. 4 July 2007. Archived from the original on 2 November 2007. Retrieved 4 July 2007. ^ "NHS terror plot: police investigate global email network used by 'bombers'". London Evening Standard. 4 July 2007. Archived from the original on 18 July 2007. Retrieved 4 July 2007. ^ "Scottish Muslims vow to fight divisive terror evil". NewKerala.com. 4 July 2007. Archived from the original on 26 September 2007. Retrieved 4 July 2007. ^ Casciani, Dominic (16 December 2008). "Iraqi doctor's road to radicalism". BBC News. Retrieved 9 July 2010. ^ "Bangalore terror link puts IISc attack under scanner". ibnlive.com. 10 July 2007. Retrieved 10 July 2007. ^ "Bomb plot doctor jailed for life". BBC News. 17 December 2008. Archived from the original on 30 December 2008. Retrieved 9 July 2010. ^ a b "Glasgow Airport attack man dies". BBC News. 2 August 2007. Archived from the original on 16 August 2007. Retrieved 2 August 2007. ^ Kent, Paul (4 July 2007). "Ringleader 'Al-Qaeda sleeper'". CourierMail.com.au. Retrieved 4 July 2007. ^ "Glasgow airport bomber communicated with Malta". 15 July 2007. Retrieved 15 July 2007. ^ "'Secret data' found on Kafeel's hard disk". The Times of India. 10 July 2007. Retrieved 10 July 2007. ^ "Bin Laden speeches found in Kafeel Ahmed's house in Bangalore = Internationalreporter.com". 10 July 2007. Archived from the original on 5 July 2008. Retrieved 10 July 2007. ^ "Glimpses into the mind of suicide-bomber". The Hindu. Chennai, India. 14 July 2007. Retrieved 14 July 2007. ^ "NI police aid MI5 on airport case". BBC News. 6 July 2007. Retrieved 7 July 2007. ^ Pierce, Andrew (5 July 2007). "Police joining the dots: Kafeel held Chechnya meet in Bangalore, the Net has fingerprints". The Indian Express. London. Retrieved 5 July 2007. ^ "Sabeel, Kafeel had joined Tabligi Jamaat: Bangalore police". Hindustan Times. 6 July 2007. Archived from the original on 30 September 2007. Retrieved 6 July 2007. ^ Oconnor, Ashling (10 July 2007). "Glasgow suspect worked for blue chip company". The Times. London. Retrieved 10 July 2007. ^ "New twist to Kafeel probe". TimeNOW.tv. 10 July 2007. Archived from the original on 13 July 2007. Retrieved 10 July 2007. ^ "Bomb plot doctor jailed for life". BBC Online. 17 December 2008. Retrieved 11 April 2014. ^ "Bangalore terror link puts IISc attack under scanner = ibnlive.com". 10 July 2007. Retrieved 10 July 2007. ^ "Baggage handler becomes web hero". BBC News. 2 July 2007. Retrieved 3 July 2007. ^ Macdonald, Alistair (7 July 2007). "Meet John Smeaton: One Kick and He Is The Hero of Glasgow". The Wall Street Journal. Retrieved 9 July 2010. ^ "'This is Glasgow. We'll just set aboot ye'". ^ "Newsagent 'karate chops' robber". BBC. 17 July 2007. Retrieved 18 July 2007. ^ "PM applauds hero airport worker". BBC News. 3 August 2007. Retrieved 9 July 2010. ^ "Airport hero talks of fame guilt". BBC News. 28 December 2007. Archived from the original on 28 December 2007. Retrieved 28 December 2007. ^ "No. 58544". The London Gazette (Supplement). 18 December 2007. p. 18305. ^ "Queen honours airport attack hero". BBC News. 18 December 2007. Archived from the original on 19 December 2007. Retrieved 18 December 2007. ^ "Honours for airport attack heroes". BBC News. 27 July 2010. Archived from the original on 27 July 2010. Retrieved 27 July 2010. ^ "Terrorist threat at 'critical'". Retrieved 9 December 2015. ^ "Terrorist' suspects 'not Scots". BBC News. 1 July 2007. Retrieved 16 July 2008. ^ "Brown calls emergency meeting". The Guardian. London. 30 June 2007. Archived from the original on 3 July 2007. Retrieved 30 June 2007. ^ a b c d "U.S. transit systems heighten security". MSNBC. 30 June 2007. Archived from the original on 2 July 2007. Retrieved 30 June 2007. ^ "Two More Terror Suspects Arrested in Glasgow Probe". NewsMax. 1 July 2007. Archived from the original on 30 January 2013. Retrieved 16 July 2008. ^ "T in the Park security increased". My Chemical Toilet. 4 July 2007. Archived from the original on 28 October 2007. ^ "Houses searched following attack". BBC News. 1 July 2007. Retrieved 1 January 2010. ^ "Police confident in bombers hunt". BBC News. 1 July 2007. Archived from the original on 9 July 2007. Retrieved 7 July 2007. ^ "Threats made after Glasgow attack". BBC News. 1 July 2007. Retrieved 1 January 2010. ^ "Security Tighter at Pearson International After Attack on Glasgow Airport". CityTV. 1 July 2007. Archived from the original on 3 July 2007. Retrieved 1 July 2007. ^ "US Warned of Glasgow Threat Two Weeks Ago". ABC News. 30 June 2007. Archived from the original on 2 July 2007. Retrieved 30 June 2007. ^ "Suspicious package forces evacuation at JFK terminal". Houston Chronicle (US Houston). Associated Press. 1 July 2007. Archived from the original on 4 July 2007. Retrieved 7 July 2007. ^ "Inspiring terror and inspiring mirth are pretty much mutually exclusive. It's the British way". Schneier.com. Retrieved 19 November 2010. ^ Garfield, Simon (7 December 2007). "Terrorists are foiled at Glasgow airport". The Guardian. Retrieved 7 November 2014. ^ "Behind the London-Glasgow plot". BBC News. 16 December 2008. Archived from the original on 18 January 2009. Retrieved 9 January 2009.